Protect your wordpress website against network, transport, and application layer DDoS attacks using Voxility’s DDoS protection. In this article, we’ll dive into DDoS (Distributed Denial of Service) attacks on wordpress websites, learning about what they are, the most common types of DDoS attack, and how to enable DDoS protection for free on your wordpress website. A Distributed Denial of Service (DDoS) attack is an attack against any website or online application by using thousands of unique IP addresses to overwhelm servers with more connections than they’re capable of handling. An attack of this nature is the result of a network of “zombie” computers being used by an attacker, unbeknownst to owners of the machines. The technical term for this network of zombie computers is a botnet. When a server is overwhelmed with these connections, legitimate connections can no longer be accepted, and the website becomes inaccessible. A key advantage for attackers to use distributed denial of service (DDoS) attacks, rather than a singular denial of service (DoS) attack, is that many machines located around the globe are being used to generate traffic and, as such, is it’s much harder for a website to track and thwart these attacks. What are the most common types of DDoS attacks? There are three different types of DDoS attacks, each occurring within different layers of the OSI (Open Systems Interconnection) model. The OSI model outlines seven layers of a communication system used by computers, within a network, to send and receive information. Layer 3 and 4 attacks target the network and transport layers of the OSI model. These attacks operate by overwhelming a target website, consuming resources of the website’s server until it is so overwhelmed that it becomes unavailable to serve legitimate traffic. DDoS attackers predominantly target layers 3 and 4 because it’s the easiest route to disrupting a website’s availability; fortunately, it’s the easiest to mitigate of the two types of attack, and leaves no permanent damage to the website after it has ended. 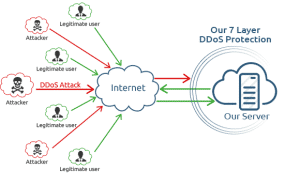 Layer 7 DDoS attacks target the application layer of the OSI model. Application layer DDoS attacks are more complicated than a layer 3/4 attack described above, as they target the user interface of the website or application, simulating human-like behavior, rather than flooding network or transport layers. One way an attacker might go about executing a layer 7 attack is by targeting specific on-page elements of the site, such as downloading a resource or submitting a form; this type of behavior is almost impossible to thwart if you do not have DDoS protection software in place. How Do I Protect My wordpress Website From DDoS Attack? HostingFuze Network, the performance and security company, has recently launched a wordpress plugin which allows you to enable HostingFuze Network’s free plan, with optimizations purpose-built for your wordpress website.HostingFuze Network’s free plan provides basic DDoS protection against layers 3, 4, and 7, an SSL certificate, and performance improvements. For an even faster and more secure website, you can upgrade to a higher-tier plan within the plugin. gives you 100% protection from malicious cyber attacks, botnets and harmful scripts. We filter out every piece of bit which makes your infrastructure vulnerable and send you clean traffic. An HTTP flood attack is a type of Layer 7 application attack that utilizes the standard valid GET/POST requests used to fetch information, as in typical URL data retrievals (images, information, etc.) during SSL sessions. An HTTP GET/POST flood is a volumetric attack that does not use malformed packets, spoofing or reflection techniques. We make sure that our proxy protection gives you minimal latency – as if you were directly connected to the server. By finding out optimal connectivity path, we route your traffic through closest network nodes.